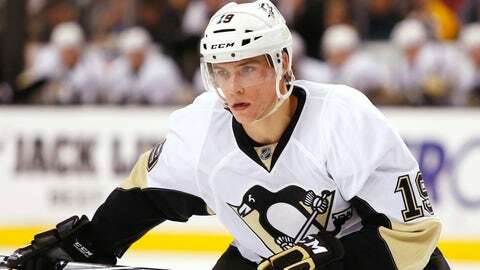 Pittsburgh Penguins forward Beau Bennett is nursing an undisclosed injury and has been ruled out for Thursday's game against the Ottawa Senators. Forward Beau Bennett has been one of the Pittsburgh Penguins’ few bright spots in an otherwise disastrous start to the season. On Thursday, coach Mike Johnston revealed that the 23-year-old Bennett is injured and will sit out the team’s game against the Ottawa Senators later that night. Johnston did not divulge Bennett’s exact injury. Coach Johnston: "Beau Bennett is injured. He'll be out for tonight's game. We will start to get some news on how long that injury will be." Bennett scored one of his team’s three goals this season on Tuesday when he beat reigning Hart and Vezina Trophy winner Carey Price in Pittsburgh’s 3-2 setback to the Montreal Canadiens. Pens unsure how long Bennett will be out for. Spoke with him after Tuesday's game. Didn't appear in discomfort. Team didn't practice Wed. The 20th overall pick of the 2010 draft, Bennett has recorded 11 goals and 23 assists in 99 career contests for the Penguins. Pittsburgh is winless through three games for the first time since 2005-06, when it went 0-5-4 in captain Sidney Crosby’s first NHL season. In addition, the Penguins’ three-goal output in a three-game stretch to begin a campaign accounts for their slowest offensive start since 2003-04.